When I wrote about ambigrams, I asked if there were any musical ambigrams. That turned out to be so; Mozart has written music that can be played by two piano players simultaneously. When they sit opposed to each other, one reads the music sheet upside down upside down. Hm, if this is difficult to understand, it is because of my English. Anyway: while thinking about other forms of ambigrams, I suddenly remembered the Upside down comics of Gustave Verbeek! This is so incredible that it is hard to imagine that the man made many of such comics. And even weirder is the fact that he is almost forgotten. And as far as I know, there are no other people known who make or made ambigram comics. Here is a link to a site where you can see the effect a little better. A few years ago I had the idea that Time may be structured like an Upside down story or an ambigram. I mean, we are experiencing Time in one direction, but that doesn’t imply that that is the only direction Time has. Maybe we just cannot perceive the other direction. Or maybe we do, but we do not recognise it as such. Maybe our mind is receiving and transmitting information trough Time. What we receive as memories are send from the past (to our self in the future), and our ideas, intuitions and insights are send from the future, from our future self to our past/present self. Our senses cannot perceive Time; it is our mind that “sees”” Time. But maybe our mind is so caught up in our senses that it gets it wrong. Maybe the present is the crossing of two opposite Time flows. I never believe any idea, especially not the ones that I come up with myself, but I still think this is an interesting idea. 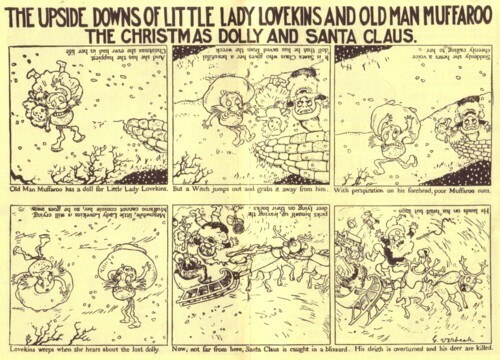 The complete run of The Upside-Downs of Little Lady Lovekins and Old Man Muffaroo, Verbeek’s Sunday fantasy comic with a story that was continued by turning the page upside-down! 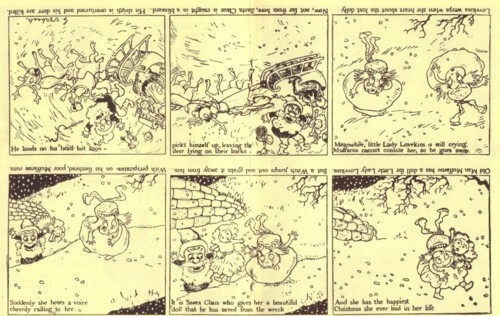 Included are all of Verbeek’s Loony Lyrics of Lulu and a sampling of The Terrors of the Tiny Tads, all in their original size and colors, with Verbeek’s paintings, illustrations, and magazine cartoons. Having seen Sunday Press’ ‘Little Nemo’ reissue, I’m certain that Peter Maresca has done a job that will amaze any Gustave Verbeek fans, and the man himself. Until then, you might enjoy this page.